Before I begin to share my research on the topic of museum accessibility, I should share a bit of my own experience with museums, as an explanation for my interest in this subject matter. My undergraduate degree from Knox College is in art history. After graduating in 2010, I began working at the Art Institute of Chicago as an intern in the Museum Education department. As part of my intensive training, I was instructed to familiarize myself with the layout of the building, noting the location of every single elevator and bathroom in relation to the gallery spaces we led our tours within. The museum is big, with a collection of over 250,000 objects, not all of which are on display. Architecturally speaking, there are several large buildings that were built over the course of a century. Moving through the space is time consuming, laborious, and non-intuitive. For a visitor, the museum can be quite exhausting, it is nearly impossible to see everything on display in a single visit. Both the Modern Wing and the historic Michigan Avenue entrances favor able-bodies, with stairs that lead to large revolving doors on the former (the automatic doors and down ramps are pushed to the sides), and a large grandiose staircase at the latter (the ramps are pushed to the left side of the façade). Even at first encounter, these entrances announce an architectural barrier to individuals in wheelchairs, visitors using strollers, and those unable to use revolving doors. The elevators are few and far between, and the ones in the older buildings are slow and deliberate, it takes time to wait and time to crawl up and down the height of the building. Half floors and elevator shafts hidden in rarely tread gallery spaces hinder fluid movement in the museum space. In terms of making the space more accessible, there are some accommodations available, but they are limited. Wheelchairs are offered upon request, though there are a finite number of them. For vision impairment, audio tours are an option but they do not include every object on display, and are not explicitly designed for visitors with vision impairment – that is, the dialogue isn’t overly descriptive of the work in a way that would be helpful for a visitor with vision impairment. There are also TacTile Kits, specially made plastic tiles with textured elevations of paintings from the Art Institute’s collection, though these tangible objects for non-visual learners are only available upon request and there are a limited number available (figure 1). The tiles depict only a tiny fraction of the works held in the museum’s collection, and require instruction by a museum educator. 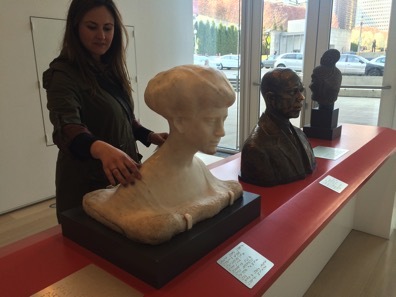 The Elizabeth Morse Touch Gallery, located in the Ryan Education Center, a free public space of the museum, offers one of the only other hands-on experiences in the museum with four sculptural busts and four corresponding labels in Braille (Figure 2). Though each of the sculptures is a different material and texture, there is little variety to them, with three out of the four of the sculptures depicting Western subjects by Western artists, and all of them similar in shape and size. Though the gallery is declared for touching, it feels like a bit of an afterthought. In short, the museum seems to favor an able-bodied, fully sighted visitor. Beyond the architectural and tactile adjustments, there are some accommodating programs in place. Tours with sighted guides are available upon request, but need two weeks advance notice for the accommodation to be met. Additionally, the museum has collaborated with the Road Scholars program, to provide tours as part of a weeklong educational visit to the galleries for art history-based tours with the mission of supporting lifelong learning for elderly museum-visitors. This educational program is led by Art Institute museum educators, and features tours that are researched and designed for both interest and comfort. The educator wears a microphone that wirelessly transmits sound to the individual visitor, making the tour content easier to hear for persons with hearing impairments. Additionally, gallery stools are provided for viewing and discussing artworks with ease – though some galleries don’t allow stools in them due to restrictions placed by curatorial staff. These simple accommodations make the gallery visit easier to digest and more comfortable for the needs of a specific demographic of museumgoers. In my time as an intern, I was able to participate in leading one of these gallery visits, and I recall the great lengths we went to provide a welcoming and comfortable environment for our older visitors. But I walked away from the experience wondering why we went out of our way to make accommodations for one group of individuals and not all individuals needing accommodations. Following my internship, I began working for the Development Office where my attention shifted from research and touring to assisting some of our wealthier constituents. Again, issues of access were ever present, as many of our trustees and highly supportive donors had mobility issues, hearing-loss, and vision impairments. During the three years I spent working at the museum, I didn’t encounter many improvements or initiatives to make the space more accessible (I was there from 2010-2013). I walked away from my experience at the Art Institute frustrated that fewer initiatives were put in place to make the museum an accessible and inclusive space, not knowing how to improve the visitor experience. I enrolled in the MUSE Program at UIC with the intent to better understand access and inclusion in cultural institutions, with the explicit aim to find disability representation in art museums. In acknowledgement of previous frustrations with the Art Institute’s lack of inclusion across programming, exhibitions, and architectural design, I’ve begun conducting research on different approaches to museum access at a variety of institutions. Though it is by no means exhaustive, this paper is an exploration of the ways in which museums have adapted themselves to be inclusive of diverse visitor groups – in particular adults with disabilities. Through researching different methods to approaching disability to create access in cultural space, one thing is true: there is no single solution for making an all-inclusive museum. The solution lies in the combination of changing attitudes toward disability, creating the infrastructure within the museum to foster problem solving, working in collaboration with members from a variety of disability communities, renovating to remove architectural barriers, creating programming that is inclusive of all communities, and implementing technology that creatively addresses a need within the museum space. By adopting activist practices and taking proactive steps towards the inclusion of diversity across visitor demographics, museums can better equip themselves to foster an accessible environment for education, understanding, and collaborative learning. These aforementioned programs at the Met laid the foundation for one of the most robust disability focused programs in the country (figure 3). In 2015, there are at least five full-time programs in place to address visitors with hearing loss, visitors who are Deaf, visitors who are blind or partially sighted, visitors with Dementia, and visitors with developmental and learning disabilities, as well as those on the Autism spectrum. Each of these programs was created to meet the specific needs of the audiences it serves, acting as an educational resource for the community, a public gathering space, and a sounding board for feedback. In terms of programming for hearing loss and the Deaf community, assistive listening devices like induction loops and FM assistive listening devices, neck loops and T-switches are available in limited quantity for adapting audio tours, and the audio tours are free of charge to visors who are hard of hearing, Deaf, blind, and partially sighted. Real-time captioning is also available for lectures, but it must be requested in advance of the lecture, and is based upon the availability of the captioner. For Deaf visitors, sign language tours and the Met Signs programs are regularly scheduled alongside the general tour programming for the museum, with some family guided tours available in ASL. Transcripts in regular and large-format print are available for all audio guide programming. To accommodate visitors who are blind and partially sighted, the Met has created a series of scheduled programs as well as a selection of programs available upon request. Two programs of note are Picture This! Workshops for Adults Who Are Blind or Partially Sighted and Seeing Through Drawing, which engage visitors with vision impairment through hands-on activities that involve touching objects from the collection, and drawing one’s own interpretation of the experience. The Met also has a Touch Collection that can be visited and touched upon request – though this collection, like the Art Institute’s is limited to sculptural forms. Tours with docents trained to give detailed verbal descriptions are also an option, with one specifically devised to walk through the Met’s comprehensive collection of Egyptian works. Art & the Alphabet: A Tactile Experience is a program devised specifically for children with vision impairment to walk younger visitors through the highlights from the museum’s collection, it is a book with Braille rather than actual objects and images, but it may help foster an interest in the museum at an early age for visitors who might not traditionally go to the Met. In terms of visitors with developmental disabilities, having pioneered programming for this visitor group back in the mid-1980s, the programs offered continued to expand. While Discoveries is still an active program, the Met has widened their offerings to include programs specific to visitors on the Autism spectrum, with tours and activities delineated by thematic subjects, age-range, and location (Manhattan or the Cloisters). Subjects cross genres including programs on color, senses, India, nature, faces, creative freedom, and reflections on art, but specialized programs are available upon request – a wonderful activity for a class trip. Exhibitions around the topic of disability are not entirely new, but they do occur with much less frequency than other exhibitions. For every exhibition focused on disability there is a different approach unique to the themes set forth by the curators and hosting institutions. Recent exhibitions include Scrapes: Unruly Embodiments in Video Art (2013, McMasters Museum of Art, Canada) in which the curatorial goal was to “crip” the museum through films that depict the “Othered” body and an exhibition design that was purposely disorienting, as a metaphor for the disabled experience brought on by impairment; LOUD silence (2014, CALIT, California) curated by Amanda Cachia, which used artist’s works dealing with extremes in sound binaries to explore the stereotype that Deaf individuals are often thought of as having no relationship with sound;, and Park McArthur’s Rampsinstallation (2014, Essex Street, New York) as an activist artistic approach to draw attention to the inaccessibility of many New York art spaces like studios and galleries.,  Each of these recent exhibitions pointed to one or more impairments, countering with an assessment of how the impairment is perceived through artistic representations. All of these exhibitions dealt with disability through an artistic lens, but what happens when curators frame disability in a social context? In 2004, the United States Holocaust Museum in Washington D.C. put together the temporary exhibition entitled Deadly Medicine: Creating the Master Race. This exhibition told an often underrepresented narrative about the individuals with disabilities who were effected by the Holocaust. By focusing on this one minority group within the larger victim-count, this project addressed a difficult topic that was often left to margins. Part of this exhibition’s goal was to shed light on the story of disability within the larger narrative of the Holocaust, mass sterilization, and the reach of the eugenics movement. In 2006, following the staging of this exhibit, the museum hosted the disability rights activist Harriet McBryde Johnson for a program titled Legitimizing the Unthinkable: A Disability Rights Perspective on Nazi Medicine, in which Johnson reflected upon the exhibition and shared her reactions to the content presented from a disability rights standpoint. Leading up to the program, the Holocaust Museum used this project as an opportunity to conduct an internal audit to consider issues of access in the museum. Though the museum follows ADA compliance, this inventory pointed to some accessibility issues that would need to be addressed before the event. The first issue was a matter of space – where in the museum could they stage this event and accommodate a large number of visitors using wheelchairs? The two main auditoriums had fixed seating, the larger theatre space could not accommodate more than 12 wheelchair users, and the classrooms available were fully accessible but not large enough for the scale of this event. To figure out the spatial logistics for the program, the museum put together an internal task force made up of an “architect, ADA officer, facility manager, special events coordinator, Webmaster, program developer, and an accessibility consultant” to work through the issues of access, ultimately deciding to create an entirely new program space, constructing a stage with a ramp (on a 12-to-1 ratio), while also simulcasting the event into alternate theater and classroom spaces in the museum to reach a larger audience. Television screens with live-captioning, sign language interpreters, and Communication Access Realtime Translation services were also provided to make the event more fully accessible, and a transcript of the event was later posted to the museum’s website for visitors who were hard of hearing or unable to attend the event. Lastly, in the days leading up to the event, a private exhibition preview was set up for stakeholders of the show, those in attendance were accessibility consultants and national leaders with disabilities, which resulted in a talk-back session where suggestions were offered to improve access before Johnson arrived for the program. The work that went into prepping for this program and the dialogues that surrounded the creation of a more inclusive space had a lasting impact on the staff at every level – and Johnson remarked in a thank you letter to the museum, “How wonderful to see everything done just right, not only just for me, but for a beautifully inclusive audience.” The staging of this single exhibition and the internal audit that occurred for the special event allowed for ongoing improvements to the architecture of the already ADA compliant building, raised awareness within the staffing of the museum, and made for an inclusive space in a museum seeking to shed light on disability within the history of the Holocaust. This program and the steps the museum took are a model for the ways in which a museum can be proactive about disability by simply beginning to shift thinking in terms of audience, definitions of disability, and basic assessments of all areas of the museum. Previously noted solutions for creating a more inclusive museum include programming and exhibitions explicitly created around the topic of disability. Another alternative solution is the creation of a cultural space that is devoted to addressing specific impairments. In Japan in the 1980s, two privately owned galleries opened to serve the visually impaired and blind museum visitor community: Sakurai Museum and Gallery Tom. Both of these alternative museum spaces were opened in private homes “to provide high quality experiences of culture, science, and art to visually impaired people through touching objects, replicas, and works of art, which were not available in public museums at the time.” The reason for creating a space devoted to meeting the accommodation of a single disability was that in terms of creating access, it’s difficult to address all of the needs of all of the visitors in one fell swoop, and after doing a study in 1998, Y. Murakami discovered that the disability most often served in Japanese museum was that of individuals using wheelchairs. By focusing on vision impairment and blindness, these two museums created activities and programs geared to the needs of one visitor demographic allowing for a communal creative space within the community. Because niche museums like these exist, assessments of the effectiveness on specific museum tools used are easier to facilitate, revealing crucial data about the needs of the blind community within the museum space. After conducting a survey in 2010 about the accommodations and expectations of the vision impaired visitor base, the following conclusions were made: staff assistance is preferred for visitors attending the museum alone, which suggests that “interpretation of the exhibitions and collections is required to better understand them”; there is an overall lack of understanding about how to use multiple senses in a museum setting; and that in order to have a successful interaction with a touch object, visitors need to “understand the proper way to touch objects” to glean the information they need. Through having a separate museum to addresses the various needs of a niche group of vision impaired and blind audience, these studies made clear that the quality of service from the staff in the institutions is more important than the facilities themselves, that is, if the staff are trained to properly address visitors with disabilities, a meaningful and enjoyable museum experience is more likely to occur. Beyond looking at what museums have done in the past and present moment, it is crucial to look toward the future of access in museums. The 2014 TrendsWatch produced by the Center for the Future of Museums points to new technologies being developed for the explicit purpose of synesthesia, or multisensory museum experiences senses other than sight. Digital scent technologies will soon be entering the market in the form of scents that will be transportable using texting and Bluetooth technology, as well as the creation of the Smell Screen, an LCD screen that releases a scent to match the image it is showing. Though it is early in the development phase, researchers at the University of Singapore are currently working on a device called the “digital lollipop” to simulate taste. The 2015 TrendsWatch is pointing to wearable technologies entering museum spaces as a prosthetic attachment to the bodies of visitors. Though this is nothing new when we think of disability, one thought is that as wearable tech becomes more ubiquitous, it may actually destigmatize the use of assistive devices. Googleglass has also been used to expand field of vision for people with vision impairment, and act as a hands-free mediated resource through voice activation. While wearable tech might not be for everyone, and it might not fit smoothly with all disability, it is a trend to look out for in both the day-to-day and the museum space. Robotics is also finding its way into the museum. Earlier in 2015, the De Young Museum in San Francisco, California unveiled a new program in which a robot operated remotely will walk visitors who aren’t in the museum on a virtual gallery tour (figure 4). What’s particularly exciting about this robot is that it has a video screen that connects to the webcam of the virtual visitor, offering a real-time engagement tool for the person virtually wandering the galleries. In-person visitors can potentially strike up conversations with the virtual visitor about the works they are simultaneously viewing. These robots were first discussed as a possible museum-tool by Henry Evans, a former Silicon Valley executive who became disabled after suffering a stroke in 2002, and are now fully operational for use in the museum. The program has been deemed successful thus far, and the de Young is hoping to procure more robots for use by visitors who are unable to visit the museum due to a variety of reasons, including disability, financial, and location-based based obstacles. Another highly discussed museum trend is the introduction of three-dimensional touchable painting reproductions created for the Touching the Prado exhibition, which opened in January of this year (figure 5). For this exhibition, the Prado commissioned the creation of reproductions of six collection favorites, including a copy of the Mona Lisa (made as a study by one of da Vinci’s pupils), and paintings by Goya, Correggio, El Greco, van der Hamen, and Velázquez. 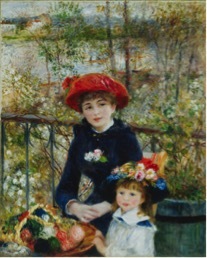 This collection of paintings was produced at a studio in Bilbao, Spain, and each reproduction was custom-made using a relief printing technique developed by Estudios Durero, and the cost of $6,680 per painting. These new paintings were created with the specific intent that they would be used by blind and vision impaired visitors as a new way to interact with the predominantly visual collection. While there are still some kinks to work out, particularly with distinguishing the difference between the texture of hair and textiles, this exhibition has been deemed incredibly successful for both sighted and non-sighted visitors, and might predict a turn toward touchable engagement in future museum practice. Through my research over the course of this semester, all roads led back to the Art Institute. The critiques I held upon my departure from the institution found some solutions, as well as the beginnings of a potential shift within the museum structure. While the building is ADA compliant, there’s a question of how inclusive the programming and exhibition designs are with regard to disability. This past year there have been some small victories stemming from initiatives put in place by my former colleagues in Museum Education. In order to put change in place, there needs to be action steps and often a source of funding for implementing change. For example, one of the museum educators approached the Office of Development about applying for a grant within the healthcare industry to potentially fund a series of disability-focused educational programming. Development steered him toward Cigna, the healthcare provider for Art Institute employees, and a grant proposal was created and later accepted. With the funds from this grant, the Art Institute was able to implement ASL tours, which were initiated by Noel King, a deaf graduate student at the School of the Art Institute of Chicago. King’s background is in art therapy, but she has extensive training in giving ASL museum tours from her time working at the National Gallery in Washington D.C., and a desire to put something similar in place at the Art Institute. Initially created as a bit of an experiment, these programs soon gained momentum, partially due to the use of social media, but in large part due to the community want for a program like this (Figure 6). I had the pleasure of attending one of the ASL tours and enjoyed the learning process, the enriching dialogue, and the fact that some 65 people joined the tour – a large number for a touring group regardless of the language it was conducted in. What had me the most excited was that this was the only tour offered on Thursday evening, the night the museum is free to the public. My takeaway from this observation is that with the ASL tour being the only tour that evening, meant that it was no different from the general guided tours, but rather a regular tour communicated in a different language. Though the museum is by no means done with the work toward making a wholly inclusive space, by making the ASL tour the only tour for the evening, the question of difference and the label of “other” was removed for me – disability was beautifully and seamlessly woven into the regular programming of the institution. Other programs in the works included the use of captioning in a Member lecture on Degas this summer, something the museum has yet to try. And a longer term goal on the wish list of the educators is to create a “style guide” for how to speak to audiences with disability, how to speak about audiences with disability, and how to incorporate disability in the general exhibition programming – not only in terms of content but also in exhibition design, lighting, and labeling methods. Potentially modeled after a preexisting guide created by the Steppenwolf Theatre, this manual would ideally shift the attitudes of museum workers across the spectrum of departments, and force a turn in the operations of the museum to create a more fully inclusive and welcome space. Though it is interesting that the Art Institute did not participate in the ADA 25 Chicago initiative, it is clear that by creating smaller-scale internal changes one department at a time, a shift will begin to occur. Judging by the high attendance of individuals with and without hearing impairment on the ASL tour I attended, the audience exists and is interested. There is an appetite for this kind of a museum, and if we build it (ADA compliant), they will come.